Thirteen different black shapes with 6 exemplars of each. 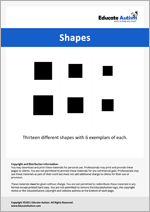 They may be useful for initially teaching basic shapes through matching or labelling. 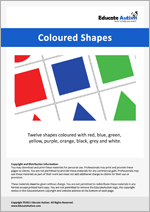 Coloured shapes that might be used for labelling programmes. Colours include red, blue, green, yellow, purple, orange, grey, black and white. 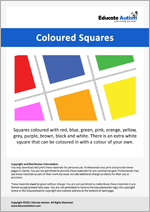 This is just one page of coloured squares including red, blue, green, pink, orange, yellow, grey, purple, brown, white and black. 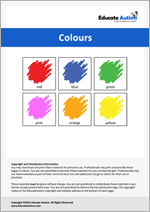 'Scribbled' and 'solid' colours on 2"x2" cards so that you can use them with picture-based Alternative and Augmentative Communication (AAC) systems. The download comes with American and British English words as well as space to write your own words. I think you are definitely on to something here with this site and sharing materials with those of us trying to teach and prep materials that others have made numerous times but not shared. Love this site and looking for more! Copyright ©2013-2018 Educate Autism. All Rights Reserved.